Inheritance is a way to implement IS-A relationship i.e. parent child relationship. Subclass inherits the subclass properties like data member, methods. Inheritance is the way of re-usability of code. Let us take the example of parent and child. A child inherits the properties of its parent. When a derived class inherits the properties and behavior from a single parent class. It is known as single inheritance. * This program is used for single inheritance example. When a derived class inherits the properties and behavior from a derived class. It is known as multilevel inheritance. * This program is used for multilevel inheritance example. Student semester = 3rd sem. When two or more derived class inherits the properties and behavior from same parent class. It is known as hierarchical inheritance. * This program is used for Hierarchical inheritance example. * This method is used to add. * This method is used to multiply. 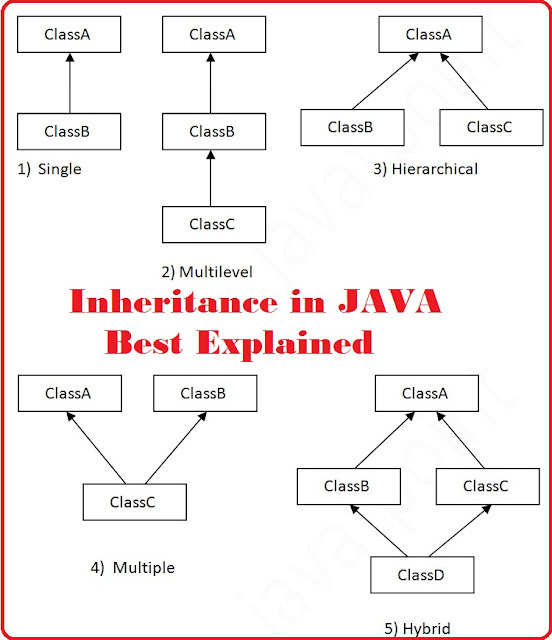 Multiple inheritance is not supported by Java because of ambiguity problem. Let us consider the below example. We have two classes Test1 and Test2 which have same method show(). If multiple inheritance is possible than Test class can inherit properties and behaviour of both Test1 and Test2 classes. Now Test class have two show() methods inherited from Test1 and Test2. Problem occurs now in method call, when show() method is called with Test class object which method will be called, of Test1 class or Test2 class. That is why multiple inheritance is not supported in java. * is not supported in java in case of classes. //let multiple inheritance is possible. //which class show() method will be called.